My Asian Salad has always been a hit at potlucks raw and cooked food alike. The textures and flavors come together so nicely that people are always coming back for more. Start the wakame flakes soaking in clean water so they can rehydrate while you prepare the veggies. Cut a whole napa cabbage lengthwise and save one half for another recipe. Put the cut side down on the cutting board and starting at the top working to the root end make very thin slices. Use the large grating holes of a cheese grater to grate the diakon and cucumber. Mix these ingredients in a large bowl. Spoon small dabs or dice the avocado over the top of the salad. Juice the lime over the top. 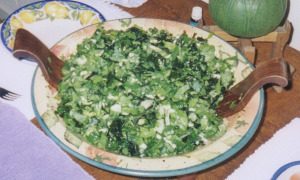 Add the rehydrated wakame flake and mix all ingredients together before serving your delicious Asian salad. I prefer to use Japanese, Striped Armenian or other soft skinned cucumbers which are softer on the palate and easier to digest. **note ~ a ripe lime should be yellow skinned, or at least not a deep green as usually seen in most stores. Ask your grocer or farmer if they can provide you with ripe limes. Of course this may be good reason to plant your own lime bush. I’m sure you’ll really enjoy this tasty Asian salad.